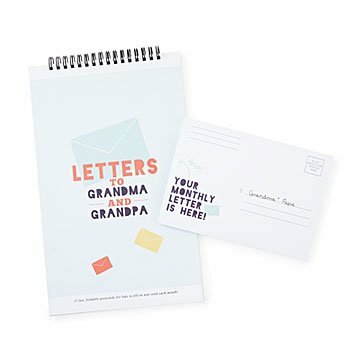 This set of postcard writing prompts helps kids stay in touch with their grandparents. Every grandparent wants to stay in touch with their grandkids. But in this day and age, if you're looking for something more lasting than a text message, you may be waiting by your mailbox for a long time. That's why designer Amy Taylor created this set of creative postcard prompts. Each card has a spot for sharing a 4x6 photo, an area for writing a short letter, and fill-in-the-blank prompts like "latest adventures," "a drawing by me," and "weather report." The set includes twelve cards, one for each month, providing a year's worth of precious, handwritten communication to read and treasure. Handmade in Colorado. Amy Taylor has always been a creative soul. At a young age, she fell in love with fashion design and pursued an education and career in the field for several years before needing a change. When she starting working for an online women’s magazine, she discovered her love of writing and graphic design. In the years that followed, she started her own freelance design company working for small businesses on their marketing materials, and she also opened her own Etsy shop. She fell in love with layout design, which led her to begin creating stationery, invitations and memory books, including baby albums. She is easily inspired by a single pattern, color, or font and her designs often flourish from that one element. She loves being able to work from home and be with her kids during the day - especially since they often inspire her in unexpected ways.